John Joseph Shannon was born on 12 February 1899 at Mackay Queensland, son of Henry Shannon and Elizabeth Mary. On 12 September 1919 he married Lillian Florence May Lewis at Sydney. He died at Kincumber on 30 July 1956, aged 57 years. Lillian Shannon died on 6 November 2002, aged 103 years. During his time on Glebe Council, Shannon worked as a labourer. 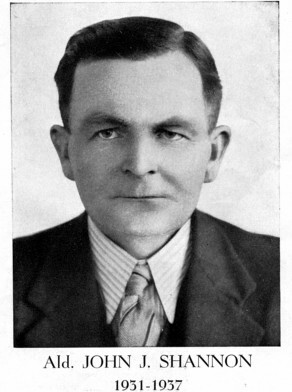 Throughout the 1930s Shannon and other Glebe people – Diver, Fitzpatrick, Foley, Holt, Lahiff McCormack, McDowell and Ward – won election after election. However Glebe Labor politics took on an entirely new complexion during the 1940s as new names dominated local branches, and on Glebe Council until 1948. John Shannon moved that Glebe Council place on record its appreciation of the capable manner in which Sergeant Sherringham and Glebe police kept order at the elections on 4 December 1937. He voted with Mayor McCormack, and three other Glebe aldermen in May 1939 for he contract system for street cleaning and garbage collection. The Labour Party policy was the use of day labour, and therefore Shannon was expelled from the Heffron Party.